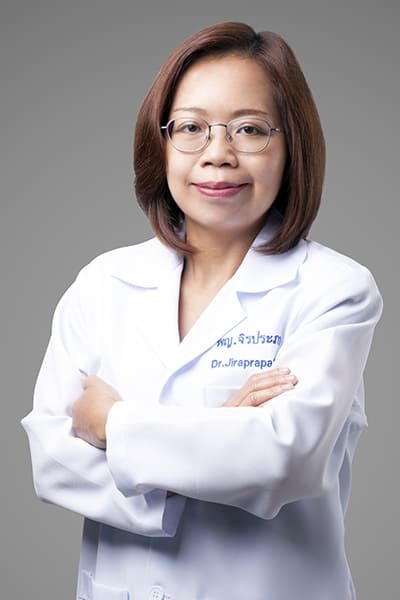 Dr. Jiraprapa Natee is an experienced gynecologic oncologist. She graduated from one of the leading medical schools in the region, the Faculty of Medicine Prince of Songkla University, in 1999. She completed her residency in Obstetrics and Gynecology from Siriraj Hospital, Mahidol University in 2005. The incidence of cervical cancer has long been reported by the National Cancer Center as the national top three cancers in female population. Recently, it was reported to be the second most common cancer among Thai women in 2010. During her early career, Dr. Jiraprapa had seen many patients suffering from this deadly disease and this experience inspired Dr. Jiraprapa with a strong intention of improving the treatment outcomes of the female cancers and at the same time preventing the women from this disease. She decided to join the advanced training program in Gynecologic Oncology and completed it in 2007 from Chiangmai University recognized as the national highest volume hospital for Gynecologic cancer. Dr. Jiraprapa also dedicated her life to educate the next generation physicians. She was appointed as an Instructor of Gynecologic Oncology at the Department of Obstetrics and Gynecology, Faculty of Medicine, Srinakarinwirot University where she was involved in both the undergraduate and postgraduate medical education. As an academic gynecologist, Dr. Jiraprapa is always eager to maintain her state of the art knowledge and skills. She continued her oversea training in Gynecologic Oncology at the International Medical Center, Saitama Medical University Saitama, Japan in 2010. Her unique national and international experiences have provided Dr. Jiraprapa with the special skills in both diagnosis and treatment of pre-invasive disease, early Gynecologic cancer, and advanced Gynecologic cancer.